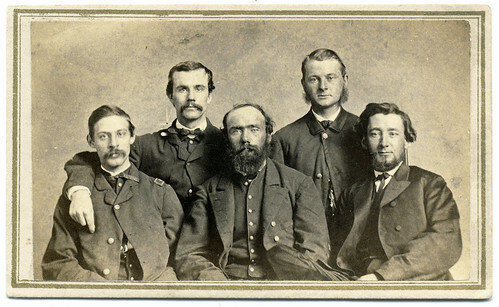 The Signal Corps was in its infancy during the Civil War, and among the pioneers who played a critical role relaying orders and messages that kept the Union military moving forward was Loring Robbins (1841-1925). His service ranged from the warships Ellen and Sebago from 1862-1863 to working with army in the Department of the Gulf from 1864-1865. In the latter situation he posed for this photograph in New Orleans. A native of Massachusetts, he’s buried in North Auburn, Maine. This image is new to my collection and is available on Pinterest, Tumblr, and Flickr. A side-wheel steamer laden with cotton chugged along the Mississippi River above New Orleans early on April 24, 1865. Her crew lounged about the deck, dressed in army overcoats to counter the morning chill, and casually smoked cigars or picked their teeth. The Stars and Stripes hung above them at half-mast, in mourning for the slain president. One of the sailors in New Orleans was Thomas Armstrong. An English immigrant who had joined the navy in 1861, he had been stationed in the Pelican City since it fell to Union forces in 1862. He had recently been appointed third assistant engineer and assigned to the supply ship Hollyhock, a paddle-wheel steamer armed with three guns. The commander of the Union gunboat Albatross, John Elliot Hart was a native New Yorker who began his navy career in 1841 and graduated from the U.S. Naval Academy in 1847. During the Civil War, he was attached to the West Gulf Squadron, where he served on several ships in and about the Mississippi River. He took charge of the Albatross in October 1862 and served in this capacity in June 1863 when he was stricken with yellow fever. On June 11, 1863, he committed suicide with a revolver in his cabin. His brother officers knew that Hart was a Mason and determined he should have a burial that honored his membership in this organization. They took the body ashore the next day under a flag of truce and arranged a funeral service with Confederate Masons in St. Francisville, La. Beginning in 1999, St. Francisville marked the event with a festival and called it “The Day the War Stopped.” The festival is still held today. His likeness is new to my collection, and now available on Pinterest, Tumblr, and Flickr. English-born Thomas Armstrong (1838-1867) began his navy career in the summer of 1861. His first assignment was on the warship “Pensacola,” a screw steamer dispatched to the Gulf of Mexico to join Flag Officer David Farragut’s newly established West Gulf Blockading Squadron. On April 24, 1862, Armstrong and his crew mates steamed with the fleet past Confederate forts St. Philip and Jackson, which protected New Orleans, La. The next day, the Union vessels engaged batteries below the city, which soon surrendered. 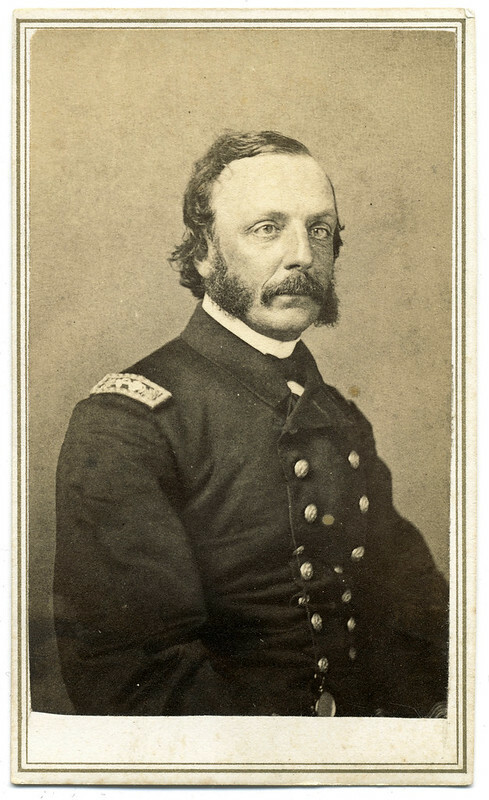 Armstrong ended the war as an acting third assistant engineer, and posed for his portrait at the New Orleans studio of Theodore Lilienthal about this time. He died of yellow fever in New Orleans in 1867. His wife, Josephine, and a daughter, Mary, survived him. 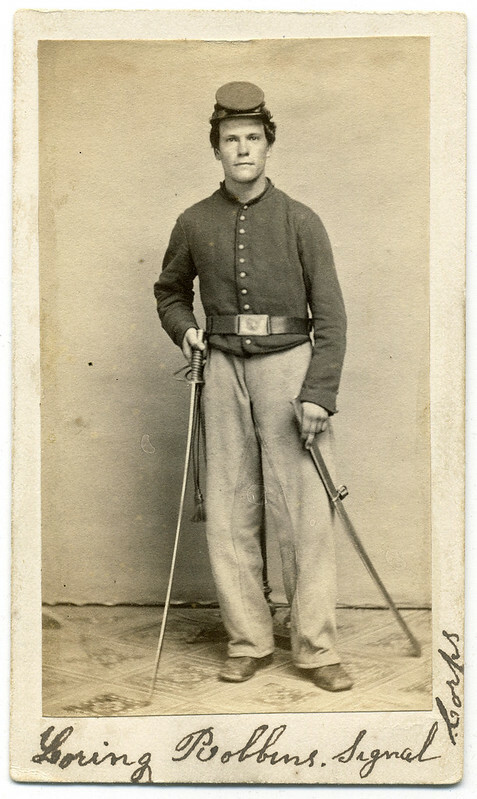 This carte de visite is new to my collection, and available on Pinterest, Tumblr, and Flickr. 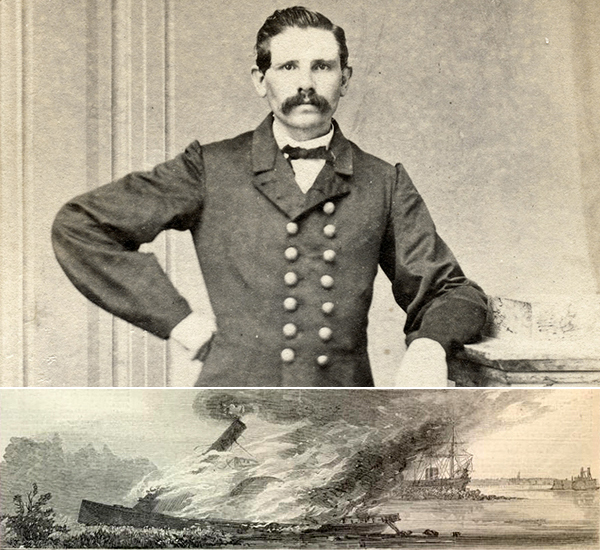 Philip Joseph Sanger, left, a second assistant engineer on the sloop-of-war Monongahela, was present at the Battle of Mobile Bay, Ala., on August 5, 1864. 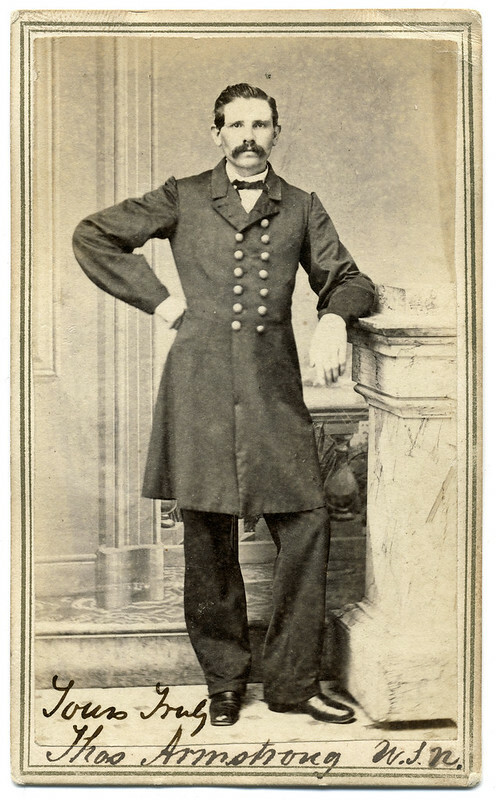 According to a note in his obituary, “He was thrown to the deck and covered with debris by a shell which demolished the bridge upon which he had been standing, but at once he resumed his post of duty and was applauded by [Rear Adm. David] Farragut for his conspicuous bravery.” He survived the war, became a physician in Philadelphia, Pa., and died in 1887. This image is new to my collection, and available on Pinterest, Tumblr, and Flickr. Is this a West Pointer who went on to serve in the Civil War? 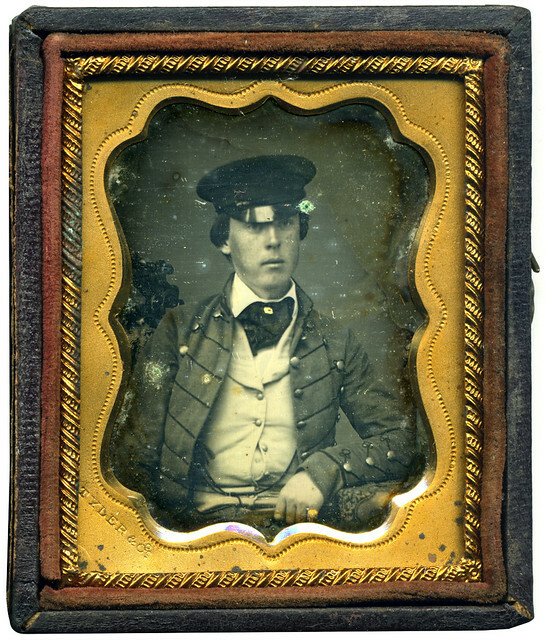 The subject of this ninth plate Daguerreotype is a clean shaven young man who wears a jacket that suggests he is a military cadet. The jacket is adorned with dark trim and smooth brass buttons, which is very similar to those worn by West Point cadets during the antebellum period. In the middle of his cravat is pinned what appears to be a fraternity pin, which supports the theory that he is a cadet. The gent also wears a felt hat with leather visor. The brass mat is stamped “Tyler & Co.” According to the late John S. Craig of the Daguerreian Society, evidence suggests that the company operated studios in Boston, Providence, Memphis, Cincinnati, Charleston, and New Orleans. This image was recently discovered at a flea market in South Carolina, which may indicate that this Daguerreotype originated in a Southern studio. Estimating his age to be about twenty, and the photograph dating to 1855, this man would have been in his mid-twenties when the Civil War began. Assuming he was alive at the time, it is reasonable to assume he enlisted in the Union or Confederate army. My brother Gary recently found this photograph at a flea market in South Carolina, purchased it at a very reasonable price, and sent it my way. He’s always on the lookout for quality images, and I appreciate his keen eye! Enter your email address to follow Faces of War and receive notifications of new posts by email.